This is one of the details that makes the Nolan sofa with (or without a) chaise end a popular choice. 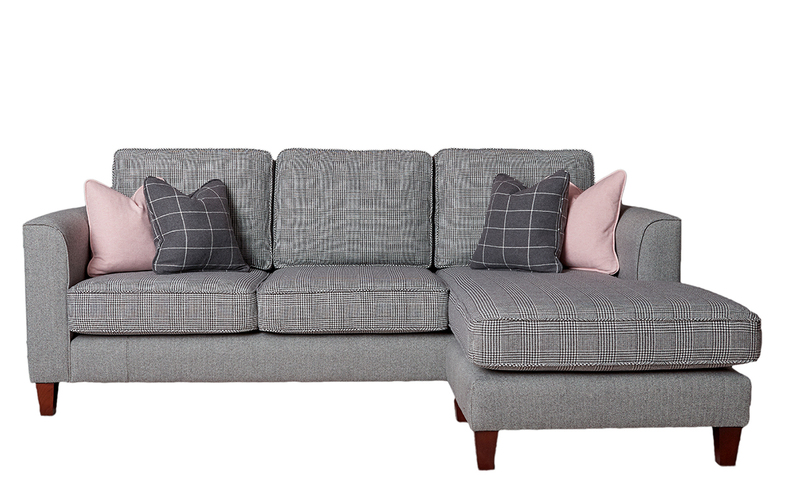 The Nolan arms are tidy & streamlined, with the depth being only 94cm / 37”, it is an ideal sofa for anyone who has a neater space to furnish, or some who simply finds a lot of models to be too deep. The Nolan Collection comes as a Large Sofa, Small Sofa, Love Seat & an Armchair & with a matching footstool or perhaps an Ottoman to finish the look, & of course the option of adding a chaise end to either side allows this sofa to become your very own napping fortress. We proudly want to present you with a new cutting edge option to add a USB port & a 360° Tablet/iPad/Phone holder built into the arm of our Colorado, Collins & Nolan models. The main feature of what we developed is that it is very neat and tidy, its very functional but doesn’t take away from the look & style of your Finline piece. It is anything but gaudy. Sleek, contemporary & functional is how we would describe this new feature. It can be put on whichever arm suits you and your room. The USB and 360° Tablet Holder can be hidden away or on full display – depending on what type of techie you are. USB & Tablet Holder Displayed on our Colorado Corner. Want more information on this bit of tech, Check out our Blog here.